فارون دهاوان (24 ابريل 1987؛مومباي ، ماهاراشترا) هو ممثل هندي وعامل في أفلام بوليوود وهو ابن ديفيد دهاوان، درس إدراة الأعمال في جامعة نوتنغهام ترنت بالمملكة المتحدةبعدها عمل مساعد مخرج كاران جوهر في فيلم اسمي خان في 2010 ، ثم بسنتين انتقل إلى التمثيل في أول فيلم له يدعى طالب السنة رفقة سيدهارت مالهوترا و عاليا بهات وحقق فيلم نجاح في شباك التذاكر  ورشح لـجائزة فيلم فير من فئة أفضل ممثل ذكر لأول مرة وفي 2014 قام بدور البطولة في فيلم الكوميدي مين تيرا هيرو. رفقة الممثلة إليانا دي كروز و نرجس فخري، بعدها شهدت مسيرته الفنية نجاحا بلعبه أدوارا محورية رفقة نجوم مرموقون في الساحة السينمائية الهندية. 2012 : أكثر الرجال المرغوبين من 2012 : #8— تايمز اوف انديا. 2012: القائمة الرائعة لأكثر ممثل جديد 2012 : فائز— تايمز اوف انديا. 2012: إستطلاع جمهور 2012 أفضل ظهور لأول مرّة : المركز الثالث— موقع Koimoi. ^ Sangghvi، Bhavikk (23 April 2013). "Varun Dhawan will attract girls even when he's older?". The Times of India. اطلع عليه بتاريخ 10 فبراير 2014. ^ "Forget girlfriend, I'll now find myself a wife: Varun Dhawan". The Times of India. 25 July 2013. اطلع عليه بتاريخ 23 مارس 2014. ↑ أ ب "The new stars of Bollywood". Hindustan Times. 31 December 2010. اطلع عليه بتاريخ 27 سبتمبر 2012. 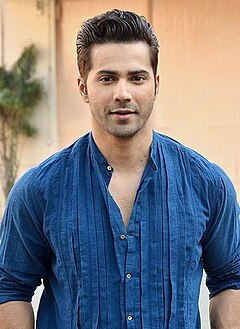 ^ "Varun Dhawan". Box Office India. اطلع عليه بتاريخ 06 أبريل 2014. ^ "'Student of the Year' Review: If fun is what you're seeking, you won't be disappointed". CNN IBN. 20 October 2012. اطلع عليه بتاريخ 19 مارس 2014. ^ "Box office verdict 2012". Koimoi.com. اطلع عليه بتاريخ 19 مارس 2014. ^ "Varun Dhawan is Ekta Kapoor's Rs. 2 crore hero". Hindustan Times. 5 January 2013. اطلع عليه بتاريخ 05 يناير 2013. ^ "David Dhawan to direct son in Kandireega Remake". Mid Day. ^ "Student Of The Year (2012): Hindi Movie Critic Review By Taran Adarsh". Bollywood Hungama. 18 October 2012. اطلع عليه بتاريخ 19 مارس 2014. ^ Basu، Mohar (4 April 2014). "Main Tera Hero Review". Koimoi. اطلع عليه بتاريخ 10 أبريل 2014. ^ "Big Star Awards 2012 / 2013 – Winners, Nominations". Indicine. 17 December 2012. اطلع عليه بتاريخ 02 فبراير 2014. ^ "Varun Dhawan— Awards". Bollywood Hungama. اطلع عليه بتاريخ 14 أكتوبر 2013. ^ "Winners: Bollywood Hungama Surfers Choice Movie Awards 2012". اطلع عليه بتاريخ 14 أكتوبر 2013. ^ "Nominations for 19th Annual Colors Screen Awards". اطلع عليه بتاريخ 04 يناير 2013. ^ "Lions Gold Awards Winners 2013". Indicine. اطلع عليه بتاريخ 20 يونيو 2013. ^ "Zee Cine Awards 2013: Team 'Barfi! ', Vidya Balan, Salman Khan bag big honours". اطلع عليه بتاريخ 21 يناير 2013. ^ "Stardust Awards 2013: list of winners". NDTV. اطلع عليه بتاريخ 20 يونيو 2013. ^ "Nominations for Stardust Awards 2013". Bollywood Hungama. اطلع عليه بتاريخ 20 يونيو 2013. ^ "Star Guild Awards — Nominees". Star Guild Awards. اطلع عليه بتاريخ 02 أكتوبر 2013. ^ "TOIFA Awards 2013 Nominations". Indicine. اطلع عليه بتاريخ 20 يونيو 2013. ^ "Winners of Stardust Awards 2014". Bollywood Hungama. 15 December 2014. تمت أرشفته من الأصل في 15 December 2014. اطلع عليه بتاريخ 15 ديسمبر 2014. ^ "Nominations for Stardust Awards 2014". Bollywood Hungama. 8 December 2014. تمت أرشفته من الأصل في 10 December 2014. اطلع عليه بتاريخ 08 ديسمبر 2014. ^ "21st Annual Life OK Screen Awards nominations". The Indian Express. 8 January 2015. تمت أرشفته من الأصل في 8 January 2015. اطلع عليه بتاريخ 08 يناير 2015. ↑ أ ب "Nominations for 10th Renault Star Guild Awards". Bollywood Hungama. 8 January 2015. تمت أرشفته من الأصل في 11 July 2015. اطلع عليه بتاريخ 08 يناير 2015. ↑ أ ب ت "Big Star Entertainment Awards Nominations List 2014". Reliance Broadcast Network. تمت أرشفته من الأصل في 16 December 2015. اطلع عليه بتاريخ 24 ديسمبر 2014. ^ "Crowd Favourites". The Indian Express. 3 January 2015. تمت أرشفته من الأصل في 3 January 2015. اطلع عليه بتاريخ 05 يناير 2015. ^ "Winners of IIFA Awards 2015". Bollywood Hungama. 7 June 2015. تمت أرشفته من الأصل في 16 August 2015. اطلع عليه بتاريخ 07 يونيو 2015. ↑ أ ب "'Prem Ratan Dhan Payo' leads BIG Star Entertainment Awards 2015". The Indian Express. تمت أرشفته من الأصل في 28 January 2016. اطلع عليه بتاريخ 27 يناير 2016. ^ "Nominations for 11th Renault Star Guild Awards". بوليوود هانجاما. تمت أرشفته من الأصل في 30 March 2016. اطلع عليه بتاريخ 21 ديسمبر 2015. ^ "Check out the IIFA 2016 nominations full list here". Daily News and Analysis. 27 May 2016. تمت أرشفته من الأصل في 30 May 2016. اطلع عليه بتاريخ 28 مايو 2016. ^ "Zee Cine Awards 2017 comeplete winners list: Alia Bhatt, Amitabh Bachchan bag top honours". Indian Express. 12 March 2017. تمت أرشفته من الأصل في 10 November 2017. اطلع عليه بتاريخ 27 نوفمبر 2017. ^ "Star Screen Awards 2016 winners list: Pink wins big, Big B-Alia get best actor and actress award". InToday.in. تمت أرشفته من الأصل في 5 December 2016. اطلع عليه بتاريخ 14 أبريل 2017. ^ "Star Screen Awards 2016 winners: Amitabh Bachchan-starrer Pink bags four awards, Alia Bhatt receives best actress". IndianExpress.com. 5 December 2016. تمت أرشفته من الأصل في 20 December 2016. اطلع عليه بتاريخ 14 أبريل 2017. ^ "iifa-2017: Alia Bhatt, Shahid Kapoor win Best Actors for Udta Punjab, here's the full list of IIFA winners. See photos, videos". Indian Express. 17 July 2017. تمت أرشفته من الأصل في 20 August 2017. اطلع عليه بتاريخ 27 نوفمبر 2017. ^ "Star Screen Awards 2018: Here's The Complete List Of Winners!". Desimartini (باللغة الإنجليزية). تمت أرشفته من الأصل في 1 January 2018. اطلع عليه بتاريخ 01 يناير 2018. ^ "Nominations for the 63rd Jio Filmfare Awards 2018". filmfare.com (باللغة الإنجليزية). تمت أرشفته من الأصل في 19 January 2018. اطلع عليه بتاريخ 18 يناير 2018. ^ "Lions Gold Awards 2018: Complete winners list and Red Carpet pictures | Free Press Journal". Free Press Journal (باللغة الإنجليزية). 25 January 2018. تمت أرشفته من الأصل في 27 February 2018. اطلع عليه بتاريخ 10 مارس 2018. ^ "Winners of Zee Cine Awards 2018 - Eastern Eye". Eastern Eye (باللغة الإنجليزية). 20 December 2017. تمت أرشفته من الأصل في 22 December 2017. اطلع عليه بتاريخ 20 ديسمبر 2017. ^ "Zee Cine Awards 2018: Check out the nominations list | Free Press Journal". www.freepressjournal.in (باللغة الإنجليزية). تمت أرشفته من الأصل في 14 December 2017. اطلع عليه بتاريخ 13 ديسمبر 2017. ^ "NBT Utsav 2018: Karan Johar, Varun Dhawan and Alia Bhatt win big at the award night! - Times of India". The Times of India. اطلع عليه بتاريخ 13 يوليو 2018. ^ "Indian Film Festival Melbourne". www.iffm.com.au. اطلع عليه بتاريخ 13 يوليو 2018. ^ "Varun Dhawan Takes Home The Best Actor Male Trophy At The Jagran Film Festival For 'October'! | LatestLY". Latestly. 1 October 2018. اطلع عليه بتاريخ 01 أكتوبر 2018. ^ "Times Most Desirable Men 2012 - Results". ITimes. اطلع عليه بتاريخ 20 يونيو 2013. ^ "Promising Newcomer Male 2012". ITimes. اطلع عليه بتاريخ 20 يونيو 2013.